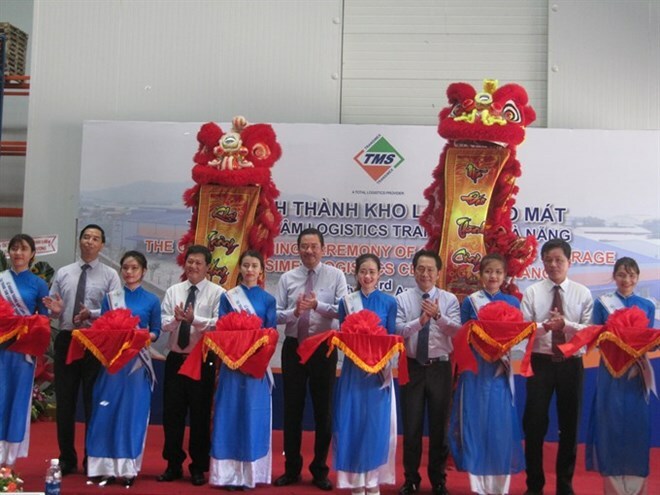 Da Nang (VNS/VNA) - The Transimex Joint Stock Corporation, listed in the HCM City Securities Exchange as TMS, officially put into operation its first international-standard cold/chilled storage unit at its logistics centre in Hoa Cam Industrial Zone (IZ) on August 3Thursday. General Director of Transimex Le Duy Hiep said the frozen storage, which covers a 1,500sq.m area with a capacity cargo load of 2,000 tonnes, aims to provide local and foreign direct investment (FDI) operatives in the central and Central Highlands region a high quality warehouse service for worldwide exports. Hiep said the number of international standard cold/chilled storage remains deficient compared with the volume of farm produce and seafood shipments in the central and Central Highlands region. The tailor-made SOP (Standard Operating Procedure) storage, which was built with an investment of 20 billion VND (885,000 USD), will also provide various logistics services, including air and sea freight, bulk cargo and trucks in connection with trading route in the East-West Economic Corridor and a system of deep sea ports at Tien Sa and Lien Chieu, as well as airports. Hoa Cam IZ, which covers on 137ha in southwest of Da Nang, has attracted 55 businesses with an 81 percent filling up rate.